Ecca Lodge is one of THE most stylish and contemporary lodges in the country – and whilst it’s funky and edgy, it still somehow seems to integrate really well into its bush surroundings! Ecca is ideal for families as there are loads of activities for kiddies – not to mention an interactive kitchen for mealtime fun! Relax in your private plunge pool with an ice-cold drink as you watch animals in the surrounding bushveld – ahhhh bliss!! Kwandwe is a much sought after bush destination – this is 22 000 hectares of exclusive and pristine private Big Five wilderness including some 30 kilometres of river frontage on the Great Fish River! 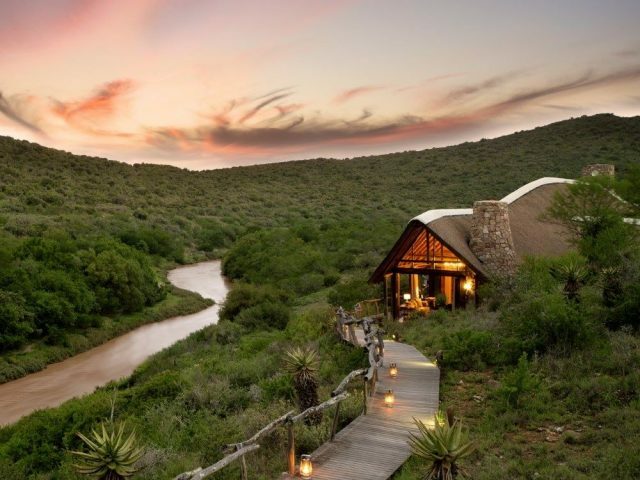 And within this gorgeous reserve there are a range of great accommodation options – from the classic Settler homestead converted into exclusive use lodge that is Uplands Homestead to the contemporary villa of Melton Manor, not to mention the extremely elegant and sophisticated Great Fish River Lodge with its 9 suites perched above the river. 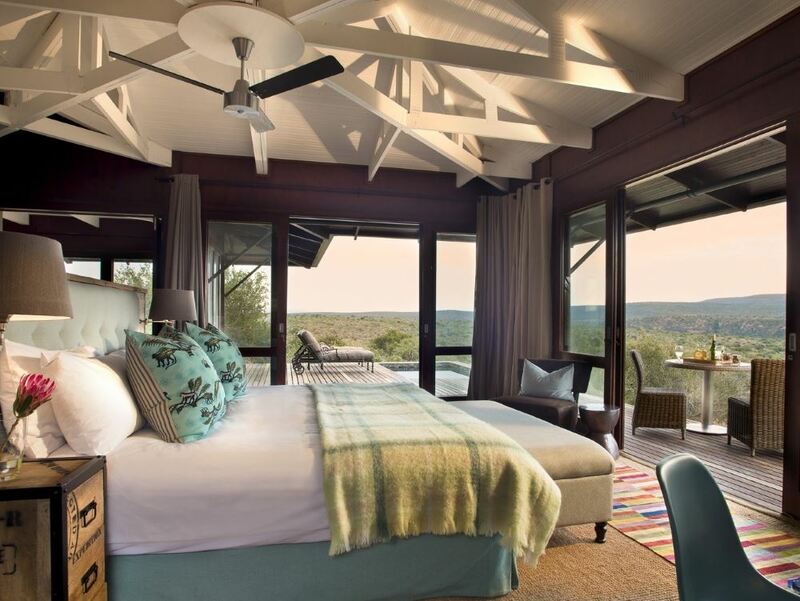 But it is the vibrant and funky Kwandwe Ecca Lodge that really gets our blood flowing! 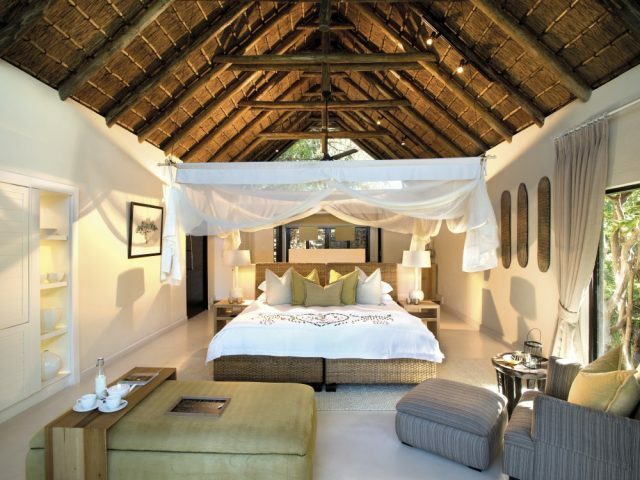 As they put it on the Kwandwe website, “forget jodhpurs, pith helmets or stiff upper lips – Ecca Lodge is youthful, relaxed, modern and trendy!” And that’s no idle boast either, as Ecca Lodge is very definitely a breath of fresh air in a game lodge industry which can so often feel all very similar and familiar. But the designers have also managed to pull off a masterful balancing act – whilst the lodge is all about cutting-edge contemporary style and edgy design, at the same time it just feels perfectly at home in and suited to its bush surroundings. 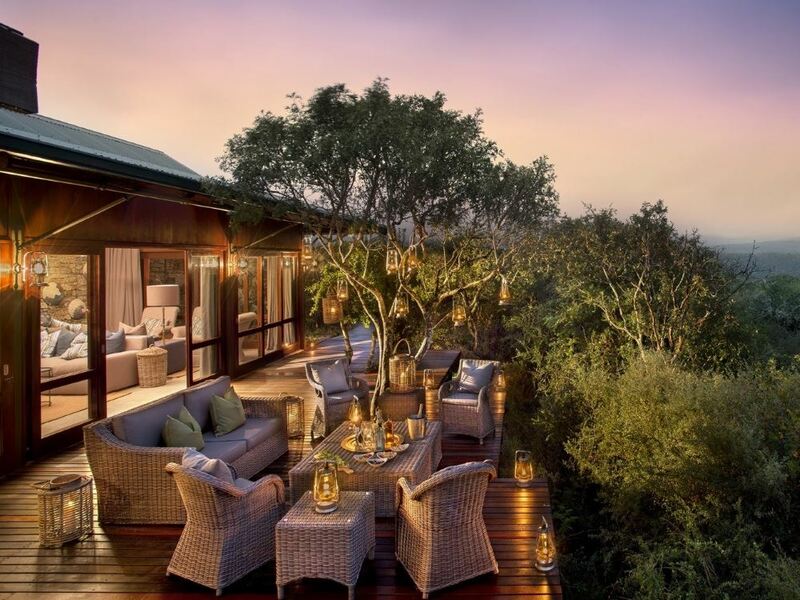 Set in thick vegetation overlooking a valley studded with acacias, aloes and spekboom, Ecca Lodge is blessed with breathtaking views onto an escarpment of steep shale cliffs. 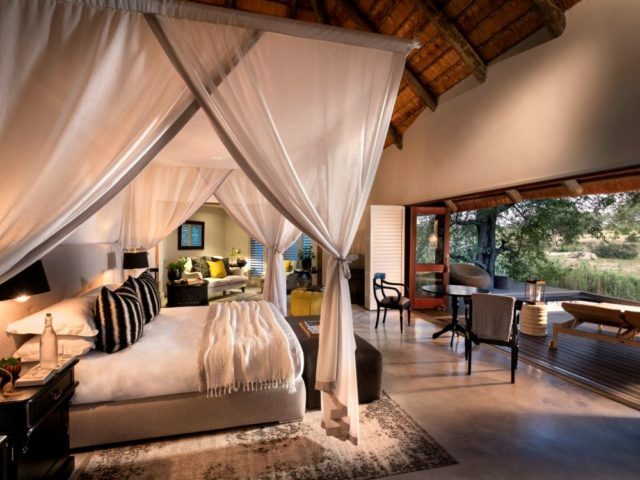 There are 6 spacious air-conditioned suites here which have to be some of the most attractive of any game lodge in the country – the overwhelming impression is one of airiness and openness, with barely a barrier between the exquisitely appointed interiors and the African bush outside! The architectural style is quite angular and minimalistic yet the interiors of the suites still feel warm and welcoming. A recent refurbishment has resulted in chic décor celebrating the vibrant colours of the African people, with each suite decorated in a different colour. Each suite features an ultra-modern, en-suite bathroom which sports mosaic mirrors and glassed shower as well as an outdoor shower (a must-have for any self-respecting luxury lodge as far as we’re concerned!) The suite’s lounge area has contemporary sofas (that can convert into extra beds) and venerable old collectables from the area and there’s loads of windows and floor to ceiling glass sliding doors which give a real feeling of spaciousness and light. These sliding doors open up to probably our favourite part of all in terms of the suites - your very own large, private viewing deck complete with stunning plunge pool! Here you have the privacy to relax and take a dip whilst watching the animals grazing in the bushveld beyond. The main public areas at Ecca are similarly impressive and stylish. There’s a spacious sitting room with fireplace, dining room and bar area, interpretive library and an expansive wooden viewing deck with a gorgeous rim-flow lap pool and loungers that are scattered on the deck ready to welcome guests ready for a lazy afternoon in the sun! Dinners are enjoyed around a blazing fire in the boma or dining room but the highlight of the guest area is perhaps the open-plan interactive kitchen for mealtime fun! Other than the overall style and décor, one of the main differences between sister-lodge Great Fish River Lodge and Ecca is that this lodge welcomes children – in fact, Ecca is really well geared up to give the little ones a great time! There’s a dedicated play centre for the kids for instance, which will provide them with hours of entertainment, keeping little hands busy with all sorts of fun activities! And the fun continues outdoor with things like poo safaris, spoor tracking and fishing trips to keep them smiling! Children of all ages are also welcome to join a ‘Horns & Stripes’ adventure morning game drive to view non-aggressive game. Talking of game drives, Kwandwe certainly does deliver on that front too. The reserve was originally farmland that has been very successfully returned to near pristine bush – more than 7000 wild animals were reintroduced and now Kwandwe (meaning “Place of the Blue Crane” in Xhosa) is a world-class Big Five safari - and is the proud home to the population of these rare, vulnerable birds. The vast landscape is affected by the ocean, with south-facing slopes capturing moisture from the sea breezes, resulting in denser or taller vegetation such as the Euphorbia trees (in fact these plants exude poisonous milky latex and are immune to destruction from most animal species - except the black rhino), while in contrast the north-facing slopes tend to be drier and more open, featuring striking aloes. At Kwandwe Ecca the highly trained rangers and trackers are passionate about sharing their extensive knowledge and understanding of the bush and its fascinating inhabitants – and their enthusiasm will definitely rub off on you! You will set out in an open 4×4 vehicle and explore the natural splendour of Kwandwe - tracking the Big Five and the thousands of other animals that roam these expansive plains. The trackers will use their eagle eyes to find the rare species that were eradicated from the area but have been reintroduced - including cheetah which have returned to the Great Fish River Valley for the first time since 1888! Night drives are a daily feature and with the use of a spotlight this will often result in unusual sightings such as the rarely spotted porcupine or the aardwolf. Kwandwe is one of the best places to spot South Africa’s increasingly threatened national bird - the Blue Crane - each year, 9 pairs return to breed here each summer and trackers are able to recognise and monitor their progress from year to year! Children of all ages welcome, accommodated in family suites.